Discover your unique Organizing Personality Type and Strategies for a more productive and clutter-free life. Fans of The Life Changing Magic of Tidying Up and Spark Joy by Marie Kondo and The Four Tendencies by Gretchen Rubin will love The Clutter Connection by organization expert Cassandra Aarssen. An organization book for diverse habits: "You're not messy, you just organize differently." 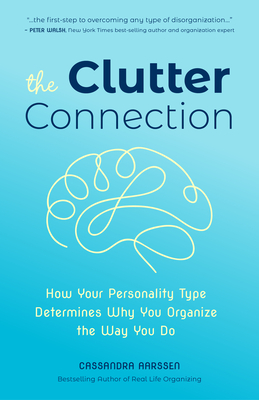 The Clutter Connection examines and explains the correlation between brain types and how they directly relate to organization and clutter. Cassandra Aarssen smashes the stereo-type that some people are "naturally messy" and offers readers insight and real-life solutions based on their unique personal organizing style. The Clutter Connection will help you get organized, be more productive and finally understand the why behind your clutter. Individualized real life organizing: Organizing isn't one size fits all. Let go of the preconceived and conventional notions of what organization looks like and finally discover what Clutterbug you are. With self-awareness comes happiness, personal growth and lasting change.